A truly magnificent and beautiful piece of art. A symbol of modern knighthood and tradition of honour and chivalry. 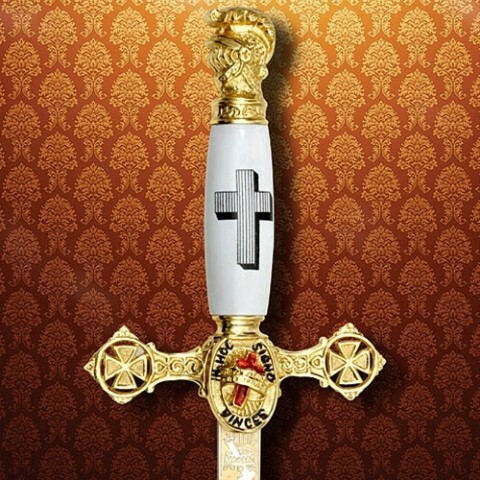 This fraternal sword came to be the treasured possession of men across the US from the 1860’s to the present day. Intricately carved, solid metal fittings plated in rich 24K gold and red enamel inlay. Symbols are finely reproduced, from the knightly helmet pommel to the Maltese cross and Cross of Life cross guard. Emperor Constantine and many other carvings adorn this significant piece. Highly polished stainless steel scabbard and 76cm blade with etching in gold. White ABS grip with traditional black scrimshaw.